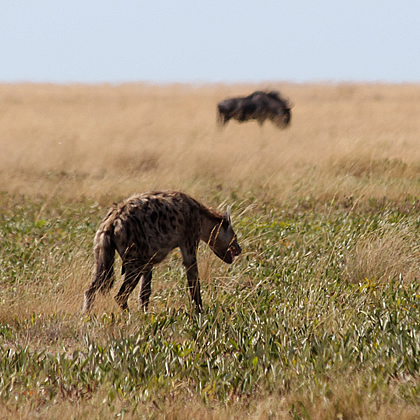 Luiwa Plain National Park is one of Zambia's wildest and least developed protected areas. Situated in the remote floodplains of the Upper Zambezi in the Western Province, the park covers an area of 3,660 km², bounded by the Luambimba river on its eastern margin and the Luanginga River to the south-west - close to the border with Angola. Liuwa (meaning 'plain' in the local Lozi language) was originally proclaimed a royal hunting area by the Lozi Litunga (King of Barotseland), Lubosi Lewanika, in the early 1880s, entrusting locals to protect the large numbers of game which congregate seasonally on the plain. The area became part of Zambia's National Park network in 1972, with local communities incorporated within the protected area, guardians of their natural wealth of wildlife. Since 2003 the Park has been managed by the African Parks (Zambia) in partnership with the Zambia Wildlife Authority and the Barotse Royal Establishment. Profits from tourism are invested in local community initiatives to promote conservation aims. This is true African wilderness - a wide landscape of flat seasonally flooded grassland with scattered pans, stands of palms and islands of trees. The expansive vistas, far-reaching horizons and wide skies humble the visitor, of which only a few hundred each year manage to experience its wild isolation. The vast grasslands support large and varied herds of grazing herbivores, with the seasonal rains and flooding driving annual cycle of movement of wildebeest, tsessebe and zebra, which congregate in large herds on the open plain. Other significant species include buffalo, red lechwe, eland, roan, Lichtenstein's hartebeest and a support cast of predators - cheetah, lion, leopard, hyaena and wild dog. Since the management of the Park was taken over by African Parks there has been a significant increase in wildebeest numbers, from 15,000 in 2003 to almost 43,000 in 2011, making the annual migration cycle the second largest in Africa after the famous Serengeti migration. 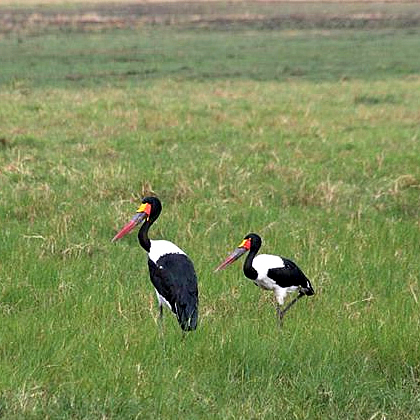 Liuwa also offers great birding, with over 334 bird species listed in the park, with a wealth of waterbirds attracted to the flooded plain, including large numbers of crowned crane, pelicans, storks, herons, egrets and assorted waders. 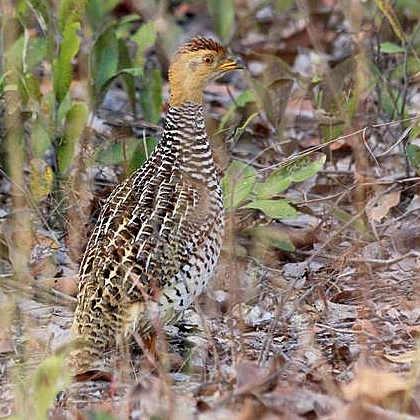 The plain is of particular note as a stronghold for the endangered wattled crane and other rarities such as the rarely seen Pel's fishing owl. As part of our excursion to Liuwa we overnight at the Ngonye/Sioma Falls on the outward and return journies from Livingstone, located a few hundred kilometres upstream of their more famous relative, the Victoria Falls. 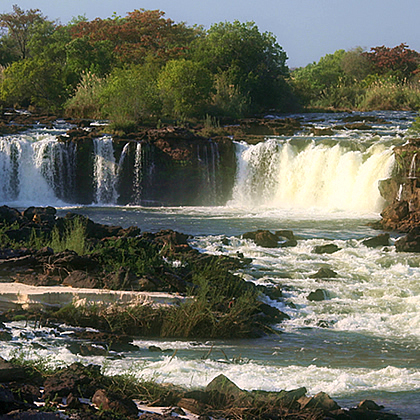 These beautiful Falls mark the transition point in the Zambezi River's flow over Kalahari sand floodplain to basalt rock – the latter eventually contributing to the magnificent gorges of the Victoria Falls. 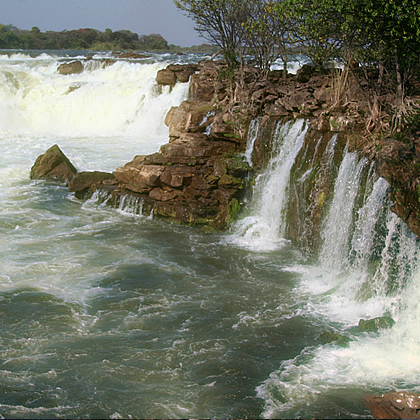 The horseshoe-shaped Ngonye Falls are mostly impressive because of the sheer volume of water that cascades over the staggered, twenty meter drop. An interesting aspect is that the river also flows underneath the rock on either side of the falls, allowing the viewer to stand above, feeling and hearing the water below. 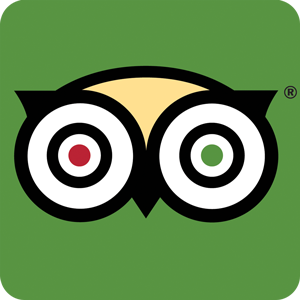 Interested in discovering Liuwa with The Mobile Safari Company? 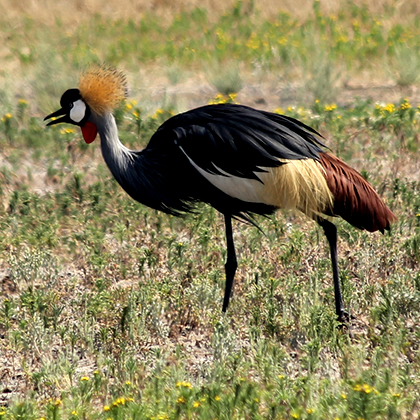 See our suggested Liuwa Expedition Safari itinerary page for more information. Interested in discovering Zambia with The Mobile Safari Company? Contact us for more information.